But my typical mindset when it comes to dessert is that more is better. Especially if fudge is involved. 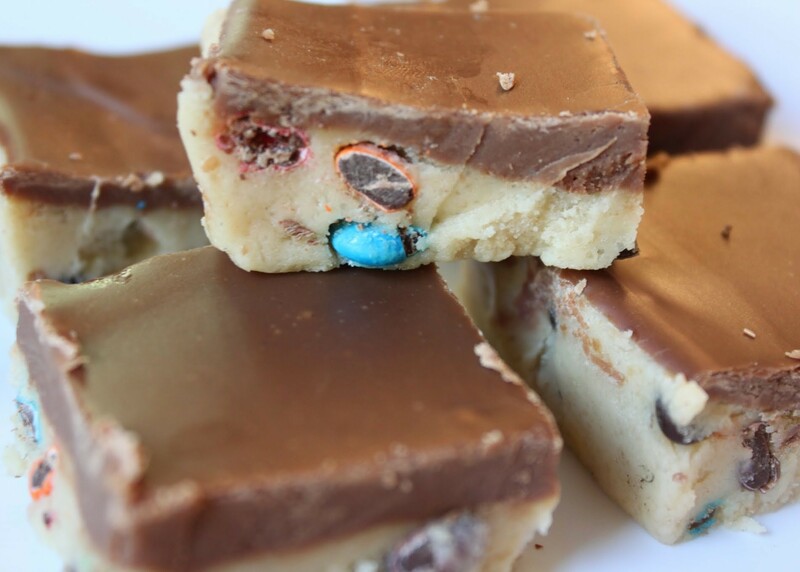 So on top of this M & M cookie dough base is a layer of thick, milk chocolate fudge. 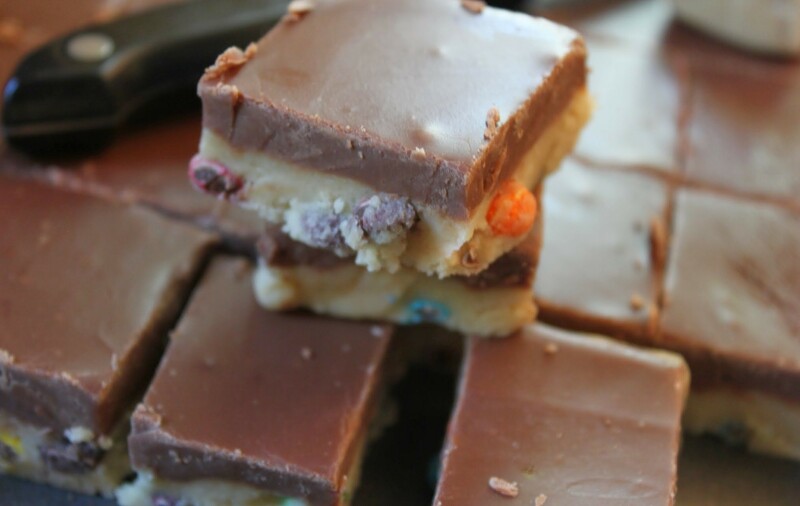 It complements the M & Ms and fulfills any chocolate fanatic’s dream. 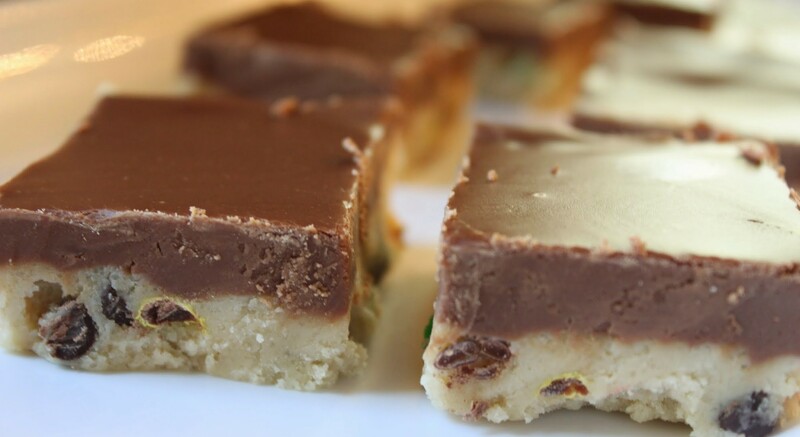 And as for adding fudge to cookie dough…why didn’t I think of this before? Happiness! This recipe is also no-bake, which I know is a big thing for some of you. I’ve never minded turning on the oven, but if your oven is tricky or broken or you just don’t want to heat up your kitchen, these bars will do the trick! And people will swear that they’re eating cookie dough. They will think they’re doing something illicit and wrong until you take that high away. Unless you don’t like eating the raw dough (and who doesn’t), get going! The only risk is that you’ll eat all of the dough before you get to the stage where it becomes bars. Willpower. Patience, people! In the bowl of a stand mixer, cream the butter and brown sugar until light and fluffy. Add in the vanilla and mix again. Pour in flour and condensed milk alternately, beating until thoroughly combined. Stir in the mini chocolate chips and mini M & Ms. Press the mixture into the bottom of a 9 x 13-inch greased pan. Next, make the fudge layer. Using a microwave-safe bowl, heat the condensed milk and chocolate chips for 2 minutes. Stir until smooth, add the vanilla, and stir again. Pour the fudge layer over the cookie dough layer, being sure to spread the fudge to the edges of the pan. Refrigerate for 2 hours. When the fudge is firm, cut into small squares and serve! I need to stop complaining. Because even though it’s been an exhausting first week back at teaching, I do love my job enormously. My students are so nice! They thank me for teaching them when they leave the classroom, and honestly, that’s just cool. I have to tell their parents how amazing their kids are on Back to School Night! To celebrate getting through week one, I had to make a cookie cake. A butterscotch one. Because I’ve been neglecting that particular flavor lately, and that just isn’t right. 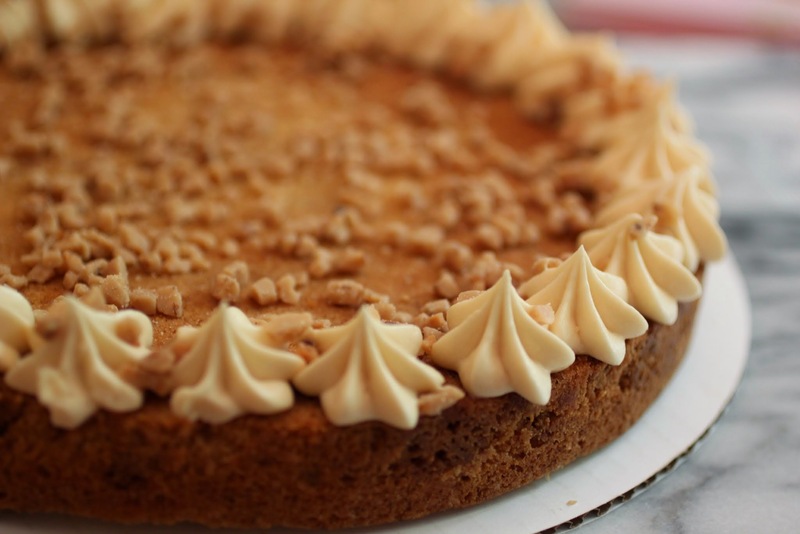 What isn’t awesome about butterscotch? Do you know what begins tonight? Anyone? If you guessed Rosh Hashanah, you’re 100% right! That’s the Jewish new year, when it’s traditional to eat sweet foods to usher in an equally sweet new year. 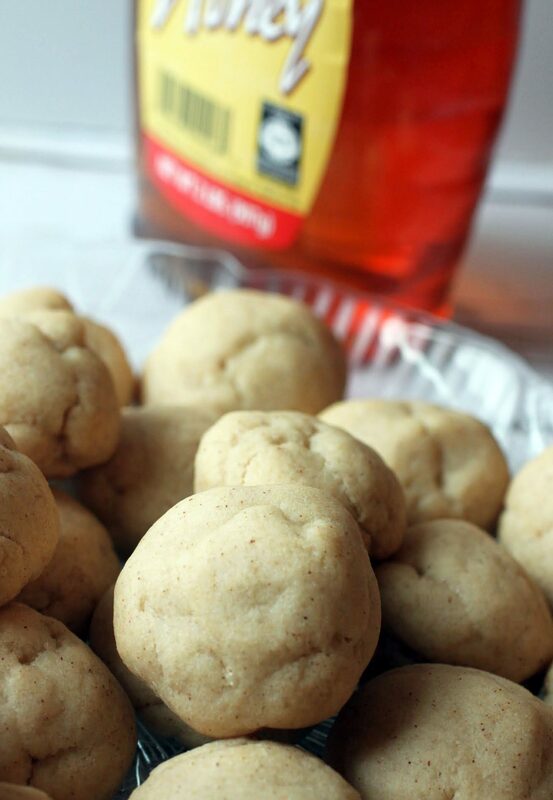 Honey is one of the most popular Rosh Hashanah foods. A lot of people make a honey cake, but as Kenny pointed out, it’s not the best of cakes. So instead, I offer up these honey cookies! Oh my gosh, this is the best fudge ever!!! Love the M&Ms in it! Thanks so much, Dorothy! It’s a good sugar high! Mmm, I just adore cookie dough (who doesn’t?). Think this wouldn’t last long in my house. It sure didn’t last long in mine! This looks easy enough that even I should be able to make it. I can’t wait to try it! You totally can! Thanks for reading! 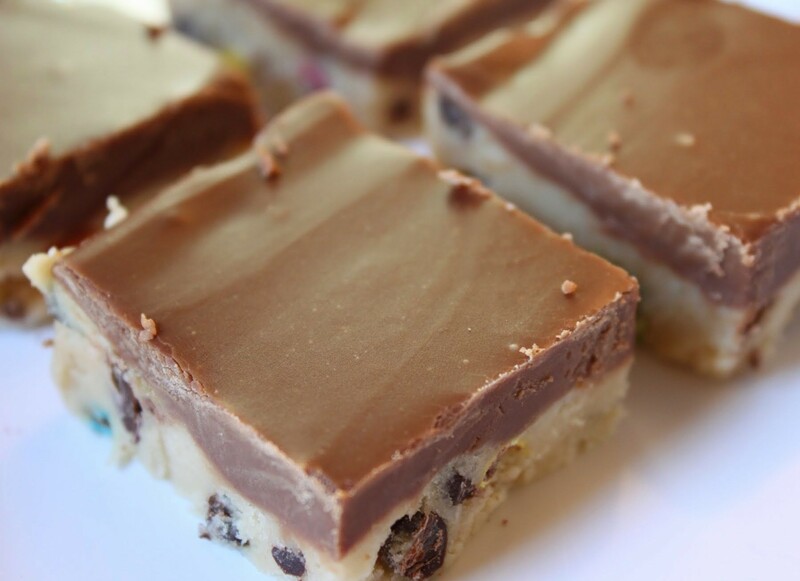 Fudge on top of raw cookie dough? Plus no bake? Yes, pleeeeease!! 😉 This looks delish! I’m sure I’d be one of those people who would be tempted to devour the entire pan! I ate half a pan of mine if it makes you feel better – and I’m making another pan tonight. It’s just that good. Oh yay! I’m so glad you liked it. Stay tuned later this week. 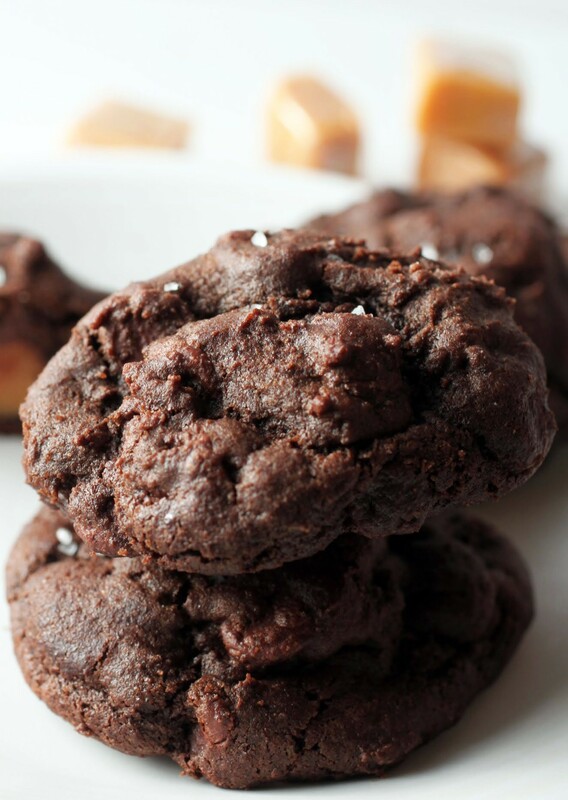 I’m sharing recipes that involve Nutella cookie dough! Thanks, Medha! You can change up the flavor, too! Medha, that’s why I love you! You just made my day. I bet you can find a way to do a vegan version, or something kind of close to it!